At Sammy’s Seafood we are committed to sourcing our fresh seafood from local commercial fishermen, shrimpers and crabbers, environmentally friendly fisheries and sustainable aquaculture farmers, and we believe that educating our customers as to why we’ve chosen each supplier is just as important. After each fresh fish passes our quality assurance inspection, we record the name of the boat, Captain and catch date, assign a 3-letter code for its fish species, and tag it with a Sammy’s TRACE™ key card. Once tagged, our customers can trace their fish from catch to plate. Ninety percent of the seafood sold and served at Locale Market is from Gulf, inland and coastal Florida waters. Using the TRACE program not only assures us that we’re getting the freshest fish from the local fleet, it tells our customers we care about the seafood they consume and where it comes from. Supporting local fisherman and taking care of the gulf is a pivotal to Parkshore Grill, and the TRACE program is a great way to highlight the restaurants involvement with the community. TRACE confirms the seafood is locally caught and sustainable. Just as well it is a good marketing tool; because people enjoy the story, they are also more conscious of the products they are consuming. Where we get our food from is very important to me. With that knowledge we can shape the future and change the world. The TRACE program allows me to educate my staff and guests on what they eat and where it came from. We want our resources to last, and prefer sustainable seafood not only because it is the most fresh and best quality, but it supports the local economy. Because that is what we are all about at Indigenous! We are an educational restaurant, so we believe it’s important for our guests to know where their food came from. It’s a nice way to guarantee where the product came from, it’s really cool! It helps keep local economy moving strong. We prefer to use fresh sustainable seafood, from local waters to help local providers. The TRACE program encourages guests to order the fish over the fillet when they know that it comes from our back yard! 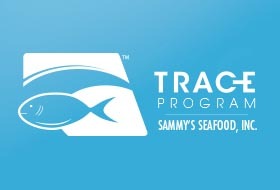 Ricky T's uses Sammy's seafood TRACE program because our restaurant is on Treasure Island Florida, on the Gulf of Mexico. People travel from all over the world to experience the gulf, and the fresh fish that comes from it. The trace program allows us to take the smoke and mirrors out of ordering fish from a restaurant. The Gulf of Mexico is how we make our money so it is important to us to use a seafood company that only use's sustainable methods of fishing to ensure the health of gulf fisheries. Supporting local fisherman and taking care of gulf is a pivotal to Parkshore Grill, and the TRACE program is a great way to highlight the restaurants involvement with the community. Sammy's Seafood believes in preserving the marine environment and the seafood industry for future generations, and agrees with the standards set by the Monterey Bay Aquarium Seafood Watch Program. Sammy's uses seafood that has been harvested using the best management practices in an effort to maintain and sustain our oceans so that better maintained stocks, reduce overfishing for long-term socio-economic benefits. Sammy’s strives for serving best seafood and service to best maintain our clients so they won't want to go anywhere else.